Pasta is a wonderfully versatile dish. You can add meats, fish, veggies, cheese, sauces in all kinds of combinations to suit pretty much any occasion. It is the gift that keeps on giving. Saying that, I’m not that big a fan of pasta 🤷‍♀️ I’m more here for the sauces, meats and veggies that go with it. Much to the dismay of Mike, who i’m pretty sure would eat pasta for every meal if he had the choice. 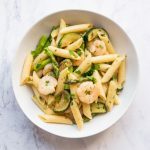 Recently however, I found myself craving something light, summery and, to even my surprise, pasta-y. 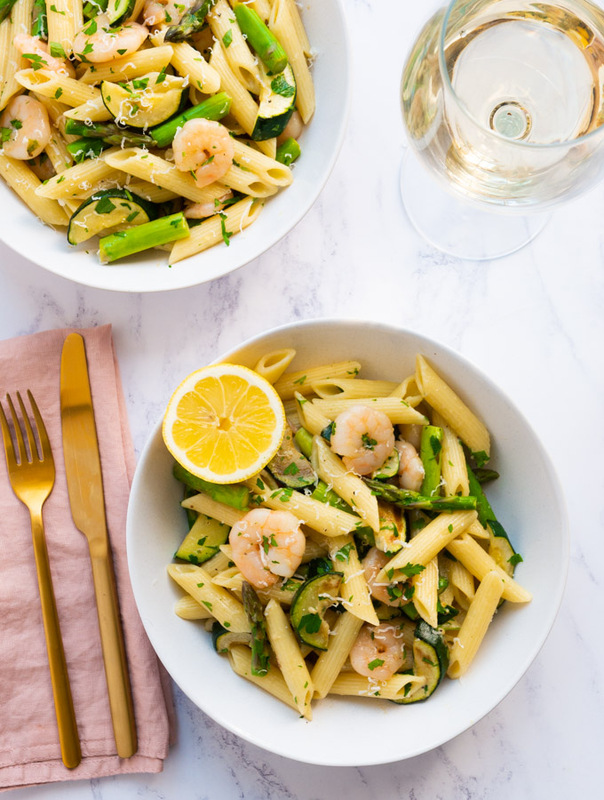 Those cravings lead to this little Penne Carbonara with Prawns and Spring Vegetables recipe, and I’m so glad they did! This Penne Carbonara is a twist on a traditional Carbonara. Pancetta is replaced with prawns and we’ve added lots of summer veggies like courgette and asparagus which makes it light and also seasonal. The sauce is a simple mixture of egg and parmesan but with lemon and parsley throw in as well. You’ve still got lots of creamy sauce like the original, so you’re still getting those comforting pasta vibes, but the flavours are fresher and perfect for this weather. Maybe with a cold glass of wine too (#balance). While your pasta is cooking whisk your eggs in a bowl with the parmesan cheese and pepper. Cook the asparagus and courgette in frying pan. Once cooked through set aside in a bowl. Cook the prawns in the same frying pan for 2-3 minutes, turning halfway though. Drain the cooked pasta, reserving some of the cooking liquid. Add the prawns, pasta and veggies back into the pan and turn off the heat. Toss your egg and parmesan mixture into the pasta, mixing everything together for 2-3 minutes, until the sauce is smooth, glossy and has thickened slightly. Add a little pasta water if the sauce is too thick. Then stir through the parsley and lemon juice. If your pan is too hot you risk the eggs scrambling instead of cooking into a sauce. Conversely if the pan isn’t warm enough the egg won’t cook! It can be a difficult balance sometimes and it definitely comes with a little bit of practice. I have a few tips to ensure you get the best sauce! Drain your pasta, using a colander, over a mug. This will ensure you have more than enough pasta water to add to the dish, should you need it (you won’t need the whole mug, but it’s better to be safe than sorry). 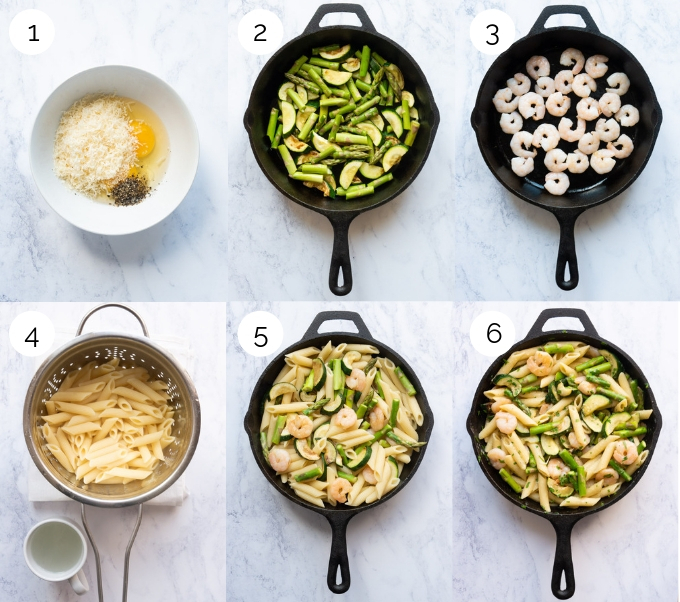 If you’re using a thicker pan, like a cast iron skillet, you may need to wait a little longer for the pan to cool as it will retain the heat for longer than your regular, run of the mill non-stick frying pan. Keep the mixture moving. The longer the sauce is in contact with the frying pan the more likely you will get scrambled eggs. Toss everything for a good few minutes, adding water as necessary, until you are happy with the sauce. SERVE IMMEDIATELY! This is best served while it is warm and creamy. I mean, technically, yes. Are you going to get the same creamy sauce? Definitely not. Adding heat back to the dish means you’re at risk of scrambling those eggs. Plus the sauce will have thickened up considerably while it’s cooled. If you’re going to reheat it do it in a frying pan, not a microwave, so you can control the temperature. Do it on a medium-low heat, and if the mixture is very thick, add a little bit of warm water to loosen things up. Take your time and stir often. Ideally, you want the carbonara to be piping hot to kill off any bacteria. It won’t be as good as fresh but it definitely won’t be bad! Allow the carbonara to cool at room temperature for no longer than two hours. Transfer everything to an air-tight Tupperware container and keep in the fridge for 2-3 days. 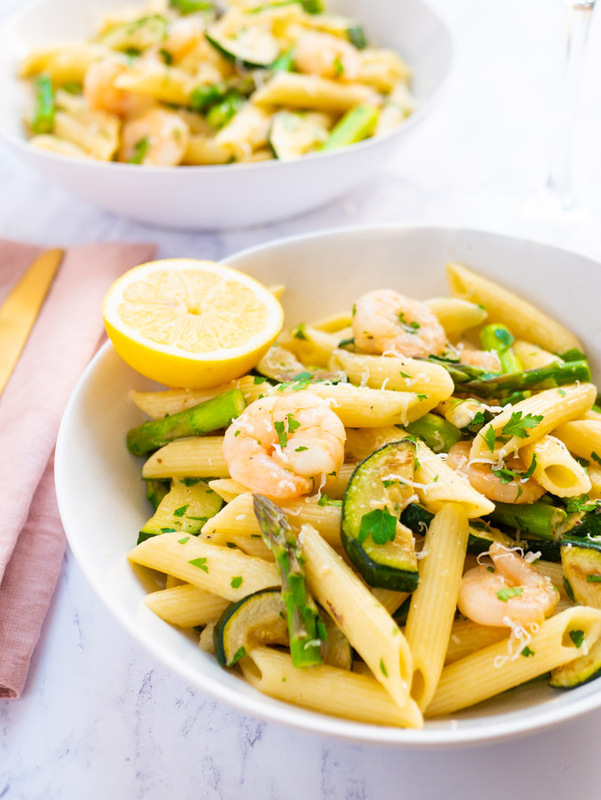 🍽 Cook the pasta, prawns and vegetables as you would in the recipe. 🍽 At the point you would take the pan off the heat, leave everything to cool completely. Transfer to a freezer-safe container and then into the freezer. Use with 4-5 months. 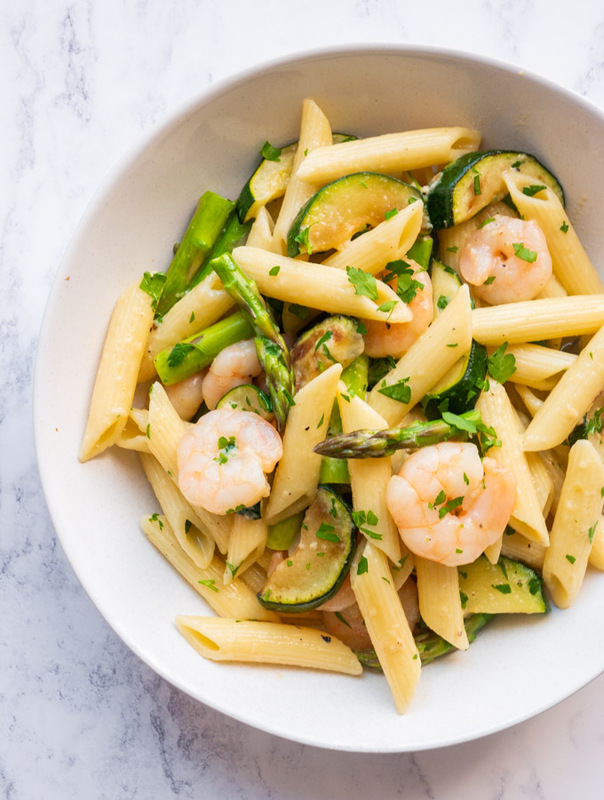 🍽 When ready to eat, thaw the pasta, prawns and veg by leaving in the fridge overnight. 🍽 Once thawed, whisk up the eggs and parmesan cheese. 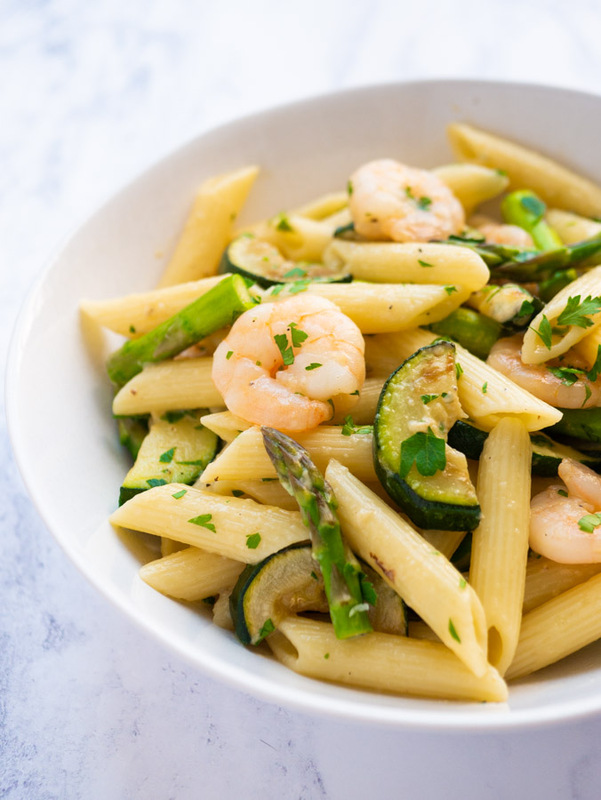 🍽 Reheat the pasta, prawns and veg in a saucepan with a few tablespoons of water until the food is piping hot. 🍽 At this point remove the pan from the heat at wait 30 seconds. Then mix in the egg and cheese mixture, stirring constantly for 2-3 minutes until the sauce has thickened and is coating everything equally. Update Information: New FAQ and affiliate links added. As I’m not generally a fan of prawns i was a bit hesitant about this recipe. I was pleasantly surprised here though. The lemon and parsley give it a really refreshing flavour that’s great in the heat we’ve been having lately .